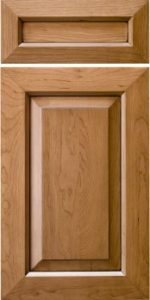 Summit (miter) is a 1″ door near the middle, but tapers toward its outside edge to a thickness of about 3/4″. The Summit provides a more contemporary look. Cross-section below is an example only. Profiles you may choose will affect final look.